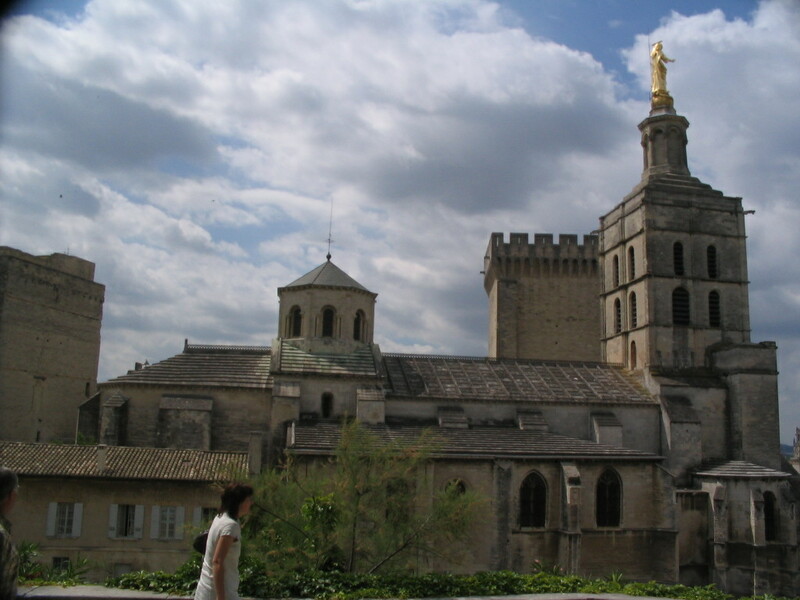 Adjacent to the Cathédrale to the north is the summit of the Rocher des Doms, the riverside promontory that led to Avignon's founding at this site. 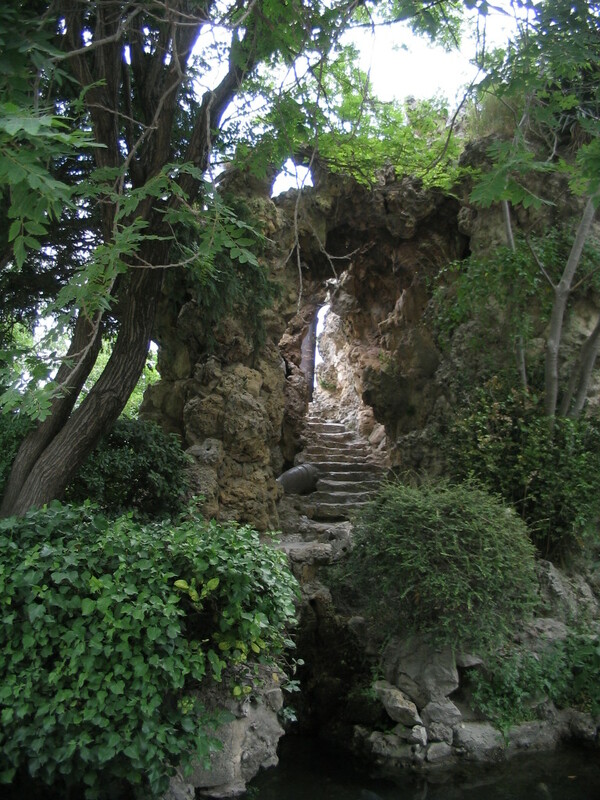 Nowadays it's a lovely garden. On the cathedral side, these fancy symmetrical ramps lead up to the top of the hill. 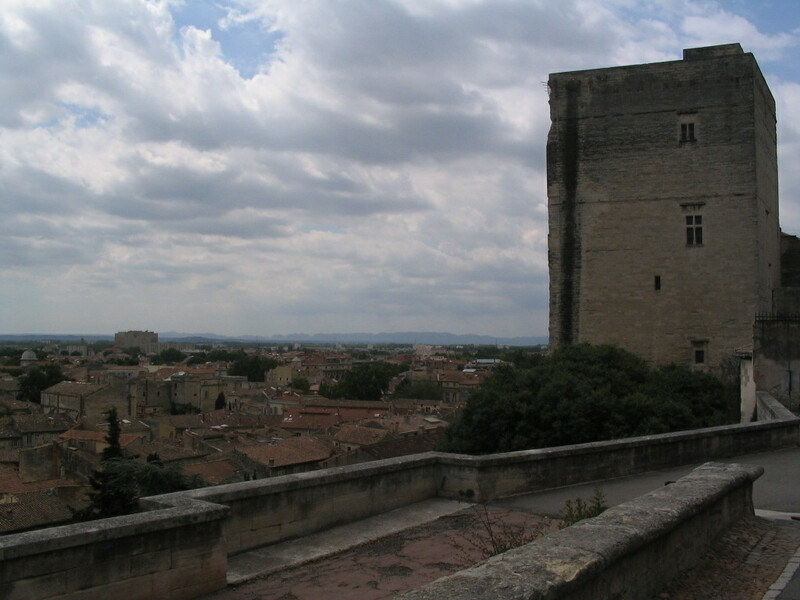 From the eastern edge of the Rocher, a viewout over Avignon's east, plus the Palais des Papes's northeast tower. 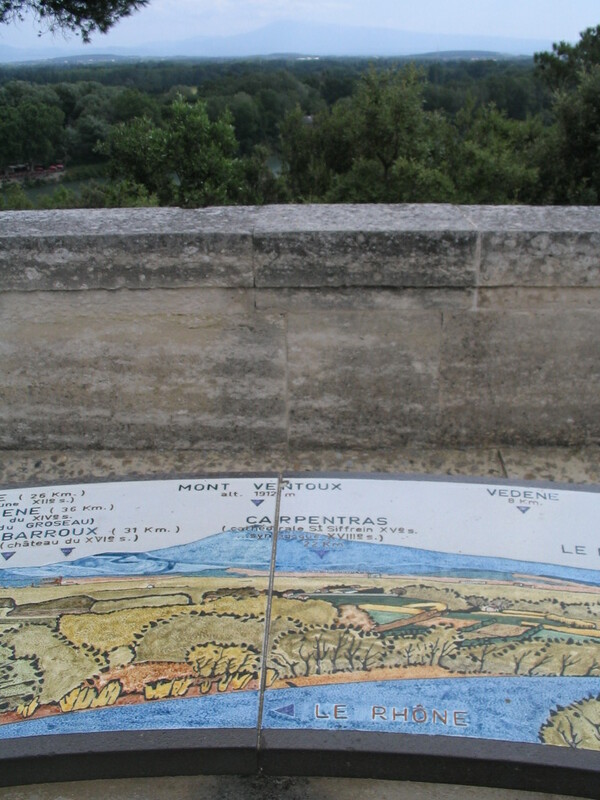 This is a photograph depicting Mont Ventoux and also depicting a tile panorama-map depicting Mont Ventoux. Streetlike cracking patterns on the tile. 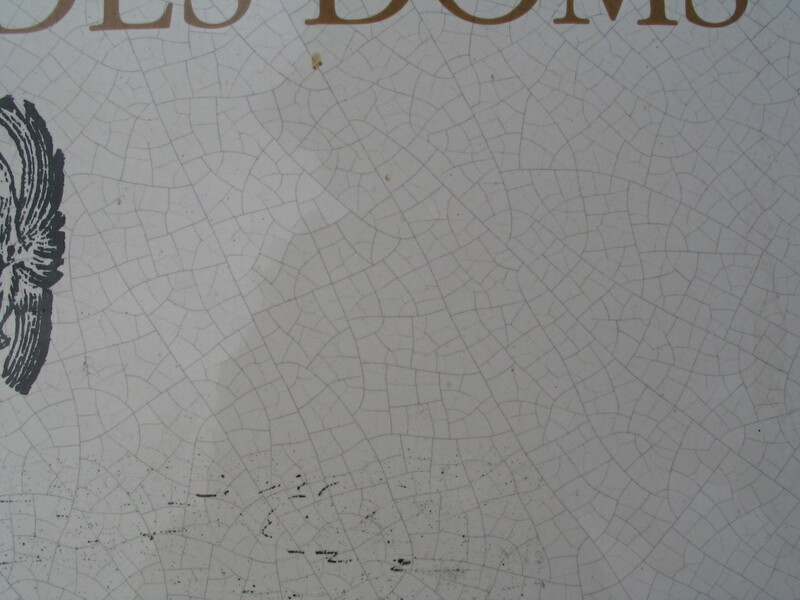 I can just get lost in such expanses, imagining that they're actual city maps. 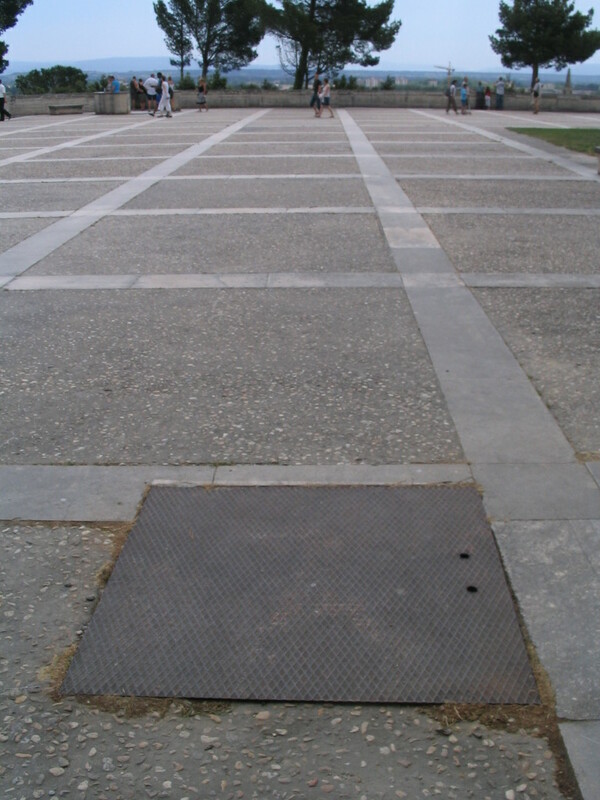 The tile map, to the left here, is at the northeast corner of this plaza at a northeastern area of the Rocher. 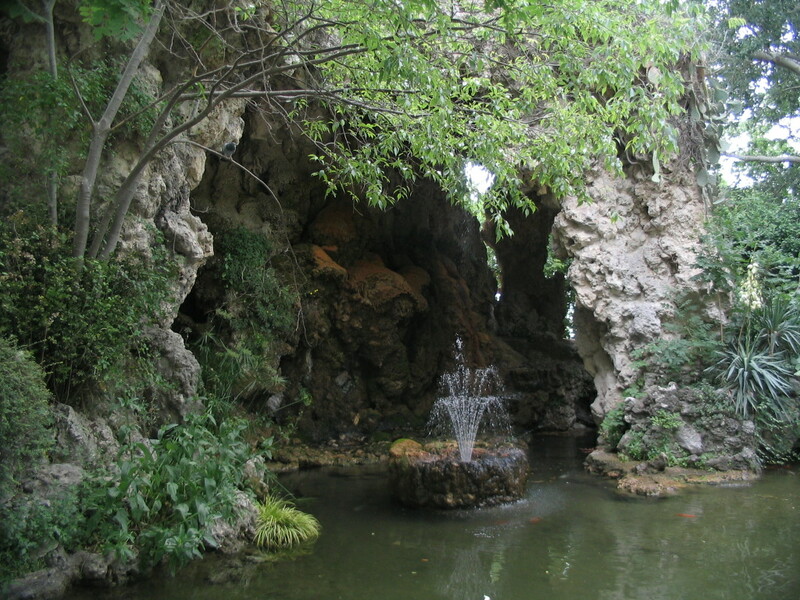 Closer to the center of the park is this neato grotto. 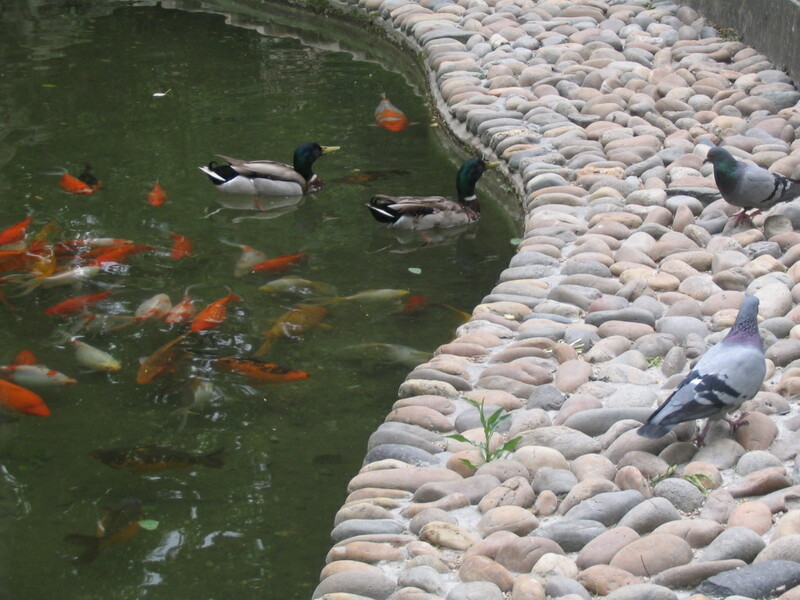 And pidgies, duckies, and koi. 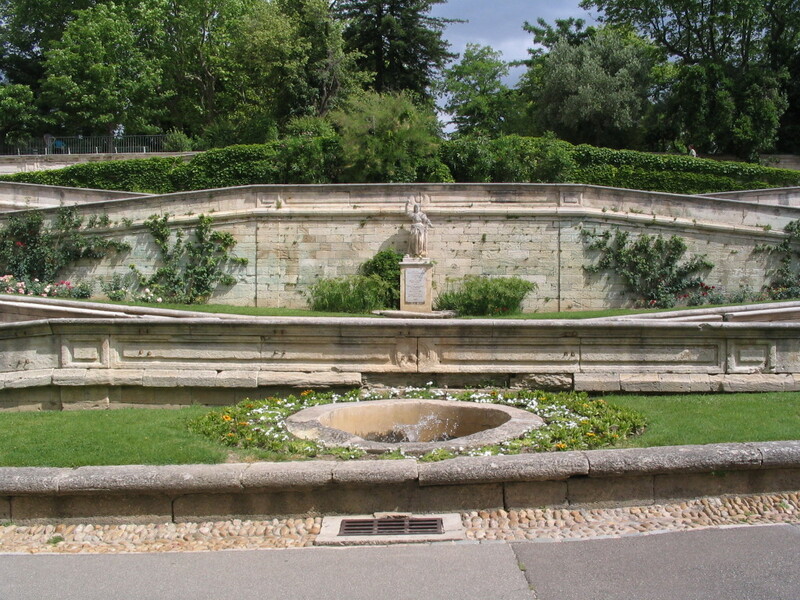 And then there's also a café right there as well. 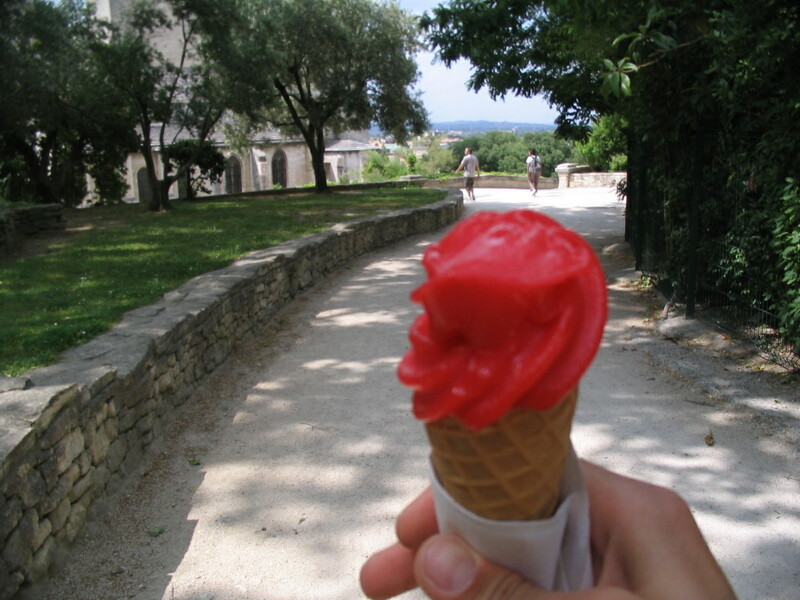 This sorbet hit the spot, and as I write this I am distinctly envious of myself from this point in time. 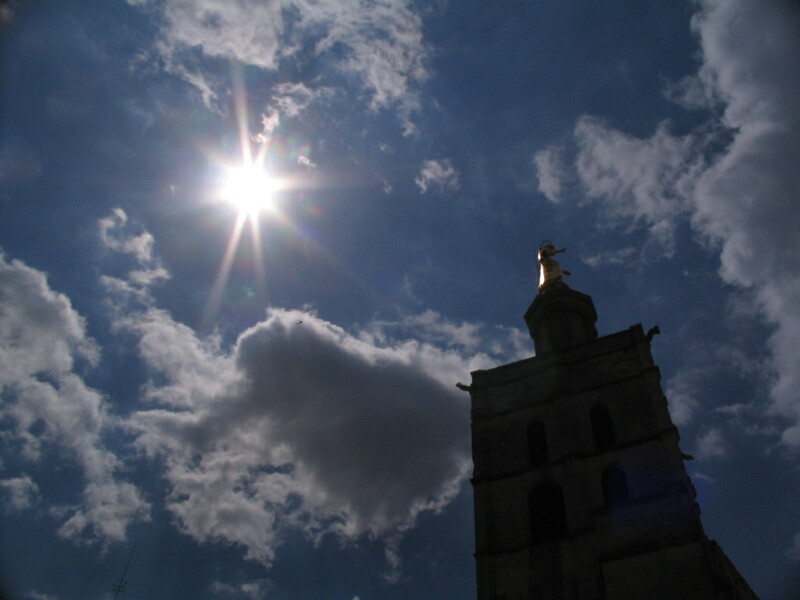 A look back over to Notre-Dame and the Palais. 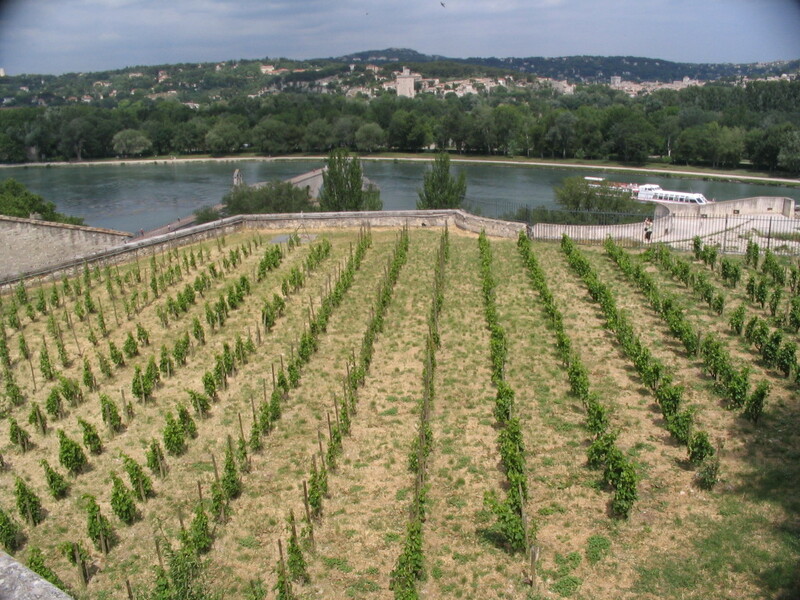 To the west, a surprise vineyard opens up on a terrace just below the park, still well elevated over the Rhône. 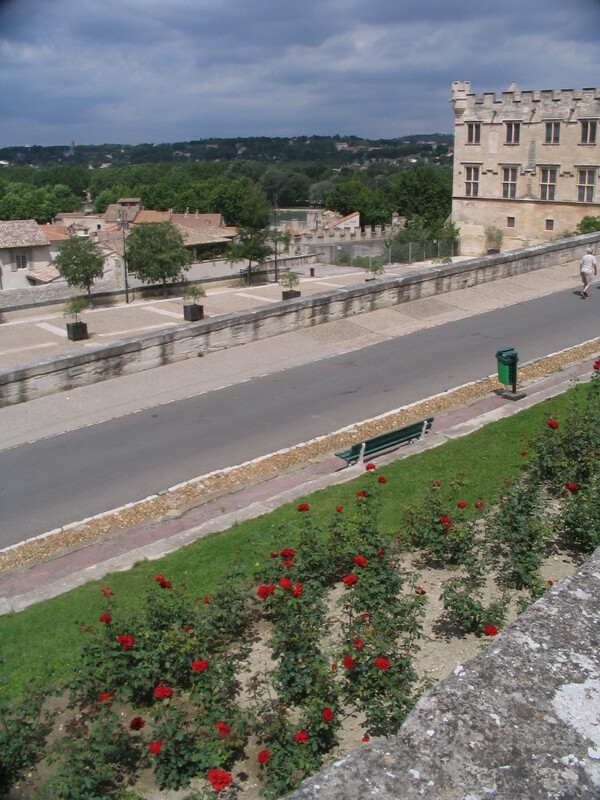 Across the river is Villeneuve-lès-Avignon. 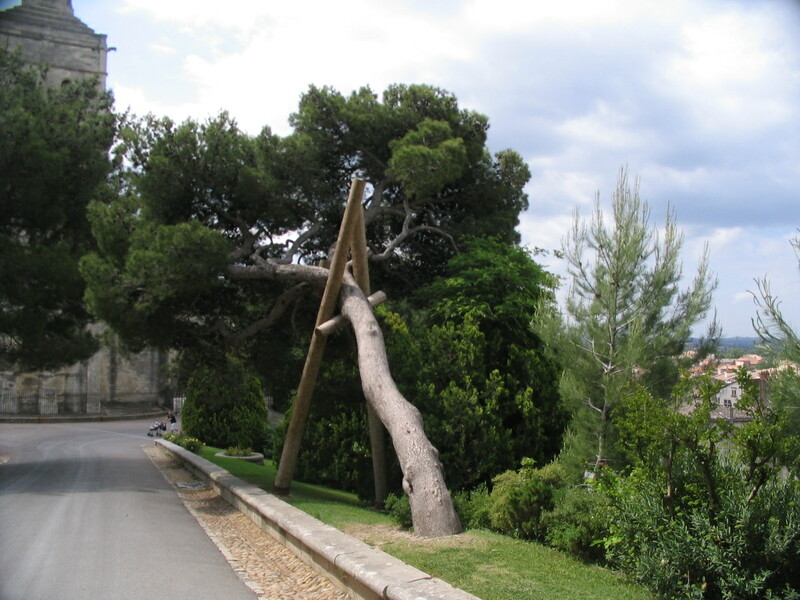 This is just one of several venerable old trees on the Rocher (well, at least two) held up by beefy crutches. I wonder why it grew this way! 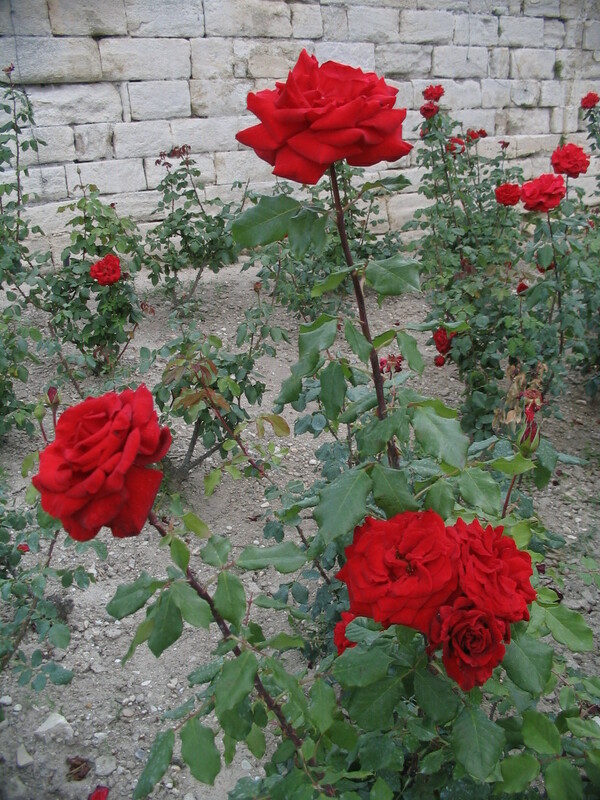 On the winding way back down toward the Place du Palais was this band of alluring deep red roses. 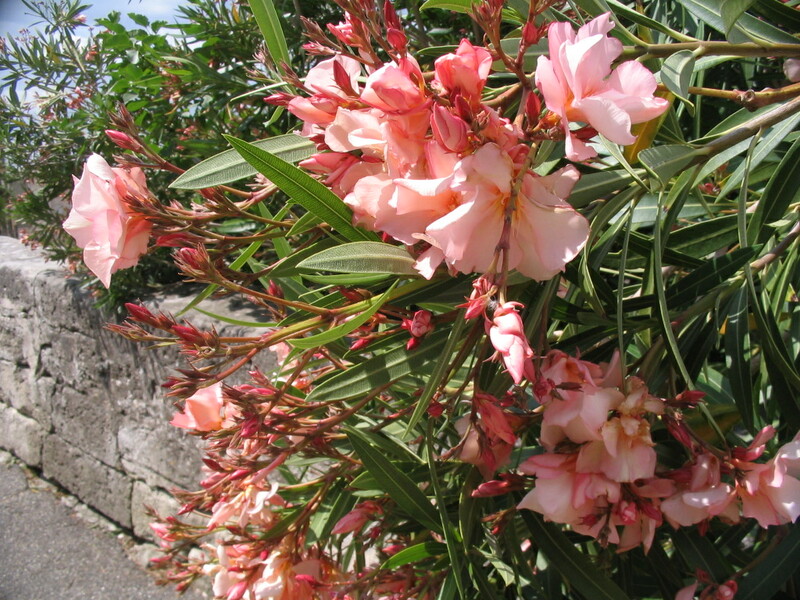 And a pretty oleander just coming into bloom. Mmmmmm, drink in the color! 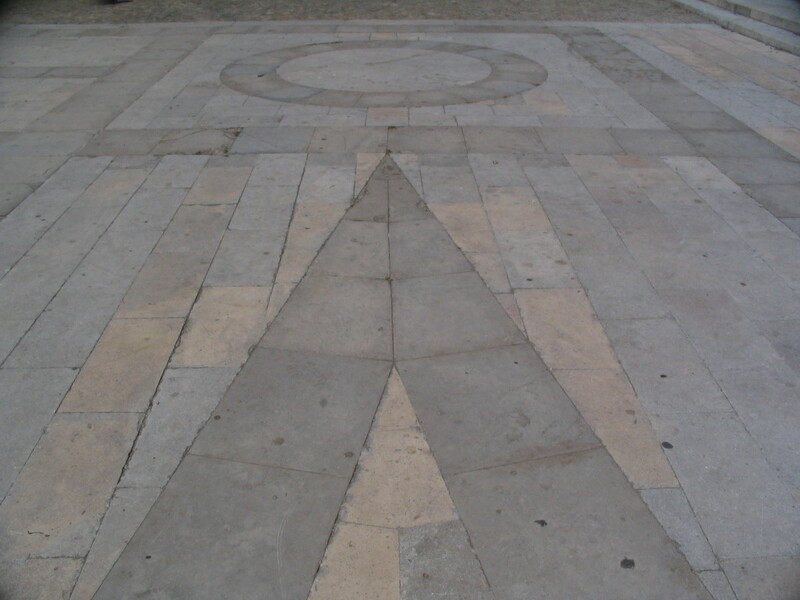 This part of the Place du Palais has these pleasingly glyphic patterns.